Premier League Under-21 teams are set to continue competing in the Checkatrade Trophy for the next two seasons. Clubs in League One and League Two have voted in favour of retaining top-flight youth sides in the competition following this term's trial format. The League One and League Two clubs voted on whether to retain the current format, revert to a 48-team knockout competition or scrap the tournament altogether. And two thirds of the English Football League (EFL) clubs canvassed voted in favour of extending the Premier League youth outfits' continued participation. "The history of the EFL Trophy is one of new ideas and innovation, but at its heart has always been the belief that this is an opportunity for League One and League Two clubs to taste cup success," said EFL chief executive Shaun Harvey. "I am therefore delighted to see the backing the Checkatrade Trophy has received from our clubs for the next two seasons, following a full and comprehensive review of this year's pilot format." The EFL has also moved to make reassurances that the inclusion of Premier League youth teams is not the forerunner to the addition of top-flight B teams to league competition. "The EFL have assured clubs that it isn't the thin end of the wedge in terms of Premier League clubs being able to enter B teams into the league," said Luton manager Nathan Jones. "I know our supporter groups have been consulted all the way through by the club's board when giving our views, and hopefully any fears they had on that front have been allayed." The EFL has increased the competition's total prize fund to £3million, with the invited Under-21s teams continuing to be required to field six players in their starting XI under the age of 21. 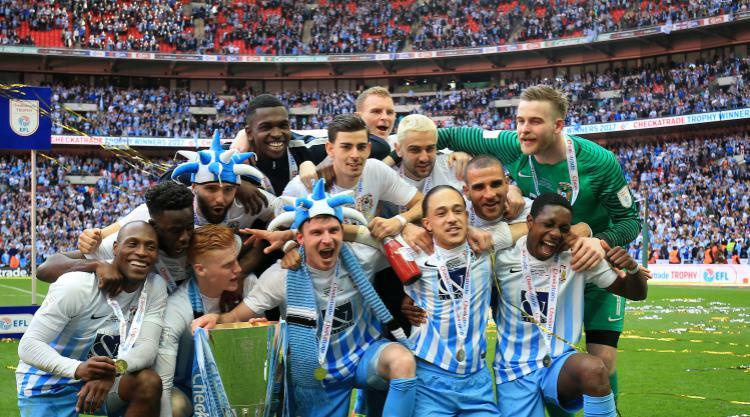 Coventry lifted the 2016 trophy courtesy of a 2-1 win over Oxford at Wembley in April, with manager Mark Robins now backing the tournament's continued format. "The Checkatrade Trophy has been an invaluable experience for those players at an under-21 level to participate in senior football. It will certainly aid their development moving forward," he said. "We won the competition with what was primarily a young team, and if you can get to Wembley and experience a fixture in front of that many fans at the National Stadium, it can only be a positive."